In a thirsty, drought-stricken Australia, the country is well and truly sunburnt. As the Eastern states are evacuated to more appealing climates, a stubborn few resist the forced removal. They hide out in small country towns – somewhere no one would ever bother looking. Bill Cook and Tobe Cousins are united in their disregard of the law. Aussie larrikins, they pass their hot, monotonous existence drinking at the barely standing pub. When strange lights appear across the Western sky, it seems that those embittered by the drought are seeking revenge. And Bill and Tobe are in their path. In the heat of the moment secrets will be revealed, and survival can’t be guaranteed. This book is written on a knife-edge line between survival and despair. The prose is perfect and the characters compelling. A blinding-hot addition to the field of Australian science fiction. This is an interesting story. At first I had difficulty with the slow pace, but soon it seemed natural to the time, place, and the depth of despair and pain the people endure and exude. Even their surroundings – dust, dead vegetation, no living animals except for the occasional bird – drag them down. Bill and Tobe are the best of friends and brother-in-laws. Bill’s sister died many years ago and perhaps that loss helps keep them together. Tobe has a tendency to disappear for long periods of time, but he always comes home, sharing his adventures with Bill. They exist in a village with a small population in an abandoned part of their country, where people who want to still live their own lives hide from the government, rather than be imprisoned. Bill has days of thirst and hunger, accepting this as part of his way of life. Food is scarce and water even more so. Food usually means hunting kangaroo – a very dangerous endeavor. Water is brought in from an individual who is lucky enough to have water on his property. It has been a long time since the military visited this area. Known as the CRP, or Creeps as people prefer to call them, they are generally viewed as killers and it is rare for anyone to survive their intrusion. These poor people’s lives consist of surviving day by day, oppressive heat, and lots of dry dirt. The economy is only what they are able to make of it, and some try to live off the land, such as it is. It is hard not to admire these characters. One night, several people see strange lights in the sky. Bound to their small patch of earth, they have no idea as to what would cause something so odd. Tobe, who has always led Bill – even as boys – decides they must investigate. Bill, although, would just as soon stay home, but he has never refused one of Tobe’s adventures, so he packs his canvas bag. Having lived in a deserted land for so long, all they fear is dying at the hands of the Creeps. What they had not planned on was being captured. The author brings to life a fascinating landscape which cannot be ignored, mostly because it engulfs everything and everyone in a manner that I saw as total control – no escape from its hardship, nor relaxing from the stranglehold. 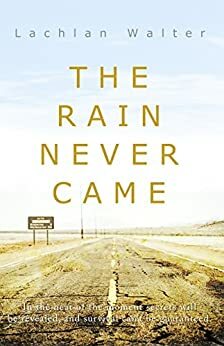 You know – not just by the book’s title – that there will never be the relief of rain, which gives hope to those who suffer. Genre and general reading age – This is definitely dystopian. Anyone who enjoys reading this type of story will probably enjoy the challenges this book presents. It is appropriate for older teens and adults. Level of sexuality – Mild. Is there graphic language? Nothing distracting. Did I cry? I was more than a little sad over their struggling existence with the heat, dust, and dead vegetation. Level of character development – Bill’s eyes were opened for the first time to the reality of being Tobe’s friend. In the past, he was able to put aside his questions, but he shows real maturing when he finally acknowledges that he cannot ignore his new take on Tobe. I felt like I suffered right along with Bill and Tobe in this fascinating tale, and I happily award it ⭐️⭐️⭐️⭐️ stars. The protagonists, Bill and Tobe have a longstanding friendship characterised by jokes, shared cultural references and love of a good time. ‘Tobe stood there, squinting in the sun with an easy smile on his face. He was my oldest friend, my best mate, the brother I never had.’ However, not all the memories they share are good ones and there are limits to what both of them are prepared to – or courageous enough to reveal – to the other. Bill is our narrator so Tobe always remains a bit of an enigma, particularly because of his mysterious comings and goings, his secretive nature and the odd nuggets of knowledge he occasionally reveals. However, Tobe is the more adventurous of the two and, as Bill admits, ‘a little manic’. When strange lights are seen in the distance one night, it’s Tobe who persuades Bill they should investigate. What follows is an incident and curiosity filled road trip with some shocking and quite gruesome findings. What the pair discover will alert them to just how precarious is the civilisation they thought they knew. Along the way, the bonds of friendship will be severely tested, traumatic events of the past will come to light and they will experience firsthand what the necessity of survival entails. I really enjoyed The Rain Never Came for its exploration of the impact of extreme climate change and its engagement with themes such as freedom and authoritarianism. The picture of a drought-stricken, lawless world was quite chilling. Personally, I would have liked a bit more exposition about the events that led to the division of the country.